East meets West: Good vs. Evil. How much anger and hatred is enough. I did something in the theme of Yin and Yang at work. This was a variation on that theme that I thought might work for something. 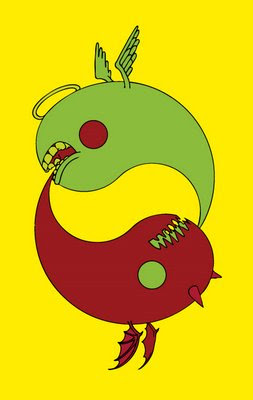 I also did another variation for Monday Artday for the theme "Opposites." This looks like evil yin and yang, if there can be such a thing! Very unique concept and drawing! very neat image- like the mouths a lot! This is a fantastic piece!!! I especially like the green guys teeth. hehe, vry cool yin yang! This is great! I think it will work perfectly for both prompts. I like it! Bravo! It's simple but telling! By the way, your piece is fantastic...great idea and execution. Cool! Such a good idea, I wish I had thought of it. Very creative interpretation of the yin yang symbol. I really like the good guy's teeth by the way. So true Josh. I often wonder this myself. You did a superb job of illustrating this! What a unique concept! Great work! I really like this piece! It illustrates "enough" and "opposites" very well! Now there is something I would wear on a t-shirt! Really Cool design! Yeah, I think you could sell a lot of T-shirts with this one. Very nice concept! It delivers the feeling of motion. Ha, ha, ha! Take a look at this… Somehow familiar, isn't it?